The VK702SS compact oven is a stylish black glass and stainless steel design, which offers both steam and grill function. The gentle process of steam cooking preserves vitamins and minerals, whilst maintaining the shape and texture of your food and being better for you too. The VK970BL is a compact oven and microwave, apart of the Designer Kitchen Range, the VK970BL can be installed above or below the designer ovens to complete the stylish look. The VK970BL has great features installed including an LED display, full touch control, 13 automatic functions, safety key lock, 3 defrost settings and plenty on functions for all styles of cooking. Small in size but huge in personality, these compact ovens provide flexible and space saving cooking that packs a punch. The compact steam oven creates crisp, healthy dishes and even features a built-in grill so that you can still brown food to create a traditional finish. The compact microwave has combined oven and grill functions that make the most of the tiny 45cm space it takes up. You can combine the compacts to create your own bespoke cooking bank, keeping everything sleek & streamlined. Putting together a bank of compact appliances is a personal thing so, before you make the final cut, keep a note of how you use your kitchen. What appliances or functions do you use the most in your kitchen? Which appliances are taking up the most space on your work surfaces? Do you have extra gadgets in every cupboard to do a vital job in your kitchen that could be fulfilled by a permanently installed unit? If you do then changing up and moving some compact appliances into your home could actually save you time, space and money in the long run. The compact steam oven is perfect for performing all the usual tasks of a built-in oven but now with a healthy edge. A steam oven will roast and cook delicately, preparing all your favourite dishes without drying food out or removing nutrients. Caring for yourself and your family can now include your cooking style with less need for fats and sugars and more crisp, healthy, tasty food available with the help of a built-in steam oven. The VK702 is compact, streamlined and finished in the same glossy black and steel to coordinate with the rest of our range. The interior has a steel finish and a removable reservoir to quickly top up water before a cooking session and easily empty afterwards; this also gives you flexible installation options as the unit does not need to be plumbed in. Not forgetting the combined grill, the steam oven can also brown or grill food for a crisp finish. This is something even the healthiest of us is loathed to give up! To accompany the compact range, the VK902 combines convenient microwave cooking with a built-in grill and fan oven. If you are limited on space, want to save space for other appliances or even simply need an extra oven cavity for side dishes sometimes the VK902 can perform all these tasks at the touch of a button. It comprises 9 different cooking functions and can take your dish from frozen to piping hot with a simple control. Designed to coordinate with the rest of our range, the combination microwave oven features a beautifully designed blue LED control panel that lights up and displays the programme, time and cooking length. We’ve also added extra safety features across the range to keep your whole family safe including a lock and triple glazing to protect small hands. Both models look fantastic over a warming drawer and you can choose from handled or handle-less designs, depending on your style. 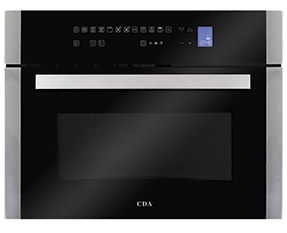 Get as much power and function from your kitchen as you can with a range of compact appliances from CDA.